RS Components (RS), the trading brand of Electrocomponents plc (LSE: ECM), a global multi-channel distributor, has started production of its second comedy podcast series following the 5-star rating of its popular History Makers series, released last year. 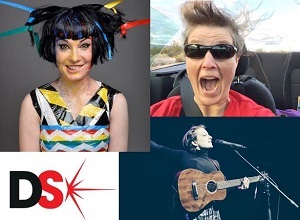 With a brand new title for 2019, to reflect its originator, The DesignSpark Podcast will feature a cocktail of fun facts, exuberant stand-up, outlandish sketches and foot-tapping songs, giving a comedic look, in the style of BBC Radio 4’s Now Show, at some of the hottest topics in technology. Robot Wars judge Dr Lucy Rogers, and award-winning comedians Bec Hill and Harriet Braine, will return to explore the ludicrous side of modern technology over six 25-minute episodes set to be released in spring 2019. The live-audience format takes influences from both BBC radio and traditional podcasts, with a mix of informal conversation, scripted comedy and spontaneous banter. While the first series delved into the lives of great inventors from the past, Series 2 –The DesignSpark Podcast – will explore the humorous side of a range of talked-about topics, from AI and robotics and space exploration to augmented human experiences and big data. The DesignSpark Podcast 2019 series will be recorded before a live audience at the Rosemary Branch Theatre (https://www.rosemarybranchtheatre.co.uk/) on the evenings of Tuesday 19th, Wednesday 20th and Saturday 23rd March 2019. Tickets are available now at https://www.tickettext.co.uk/why-did-the-chicken/. The show will be released on iTunes, Podbean and Spotify shortly afterwards. Please follow @DesignSparkRS for updates. The DesignSpark Podcast is being produced by an award-winning team from Why did the Chicken? and written by the cast alongside contributions from a range of established and emerging writers. To catch up on Series 1 – History Makers – download from www.designspark.com, www.designspark.podbean.com or the iOS Podcast app by searching for DesignSpark. DesignSpark is the online engineering community of RS Components, hosting free design tools and resources. Dr Lucy Rogers FIMechE, FBIS (https://lucyrogers.com/) is a problem solver, engineer, presenter, Fellow of the Institute of Mechanical Engineers, Maker-in-Chief for the Guild of Makers and former judge on BBC2’s Robot Wars. Bec Hill (https://www.bechillcomedian.com/) is an Australian-born, London-based comedian, with a cult following thanks to her award-winning solo shows, Twitter presence and popular YouTube videos. Harriet Braine (https://www.hd-management.co.uk/harriet-braine/) is an award-winning musical comedian specialising in bringing characters to life via up-tempo and downright funny songs. Why did the Chicken? (www.whydidthechicken.com) is an independent production company providing script services, training and original content to brands and comedy creatives. RS Components, Allied Electronics & Automation and IESA Ltd are the trading brands of Electrocomponents plc, a global multi-channel distributor. We offer more than 500,000 industrial and electronics products, sourced from over 2,500 leading suppliers, and provide a wide range of value-added services to over one million customers. With operations in 32 countries, we ship more than 50,000 parcels a day.